Coconut (Cocos nucifera) contains 55–65% oil, having C12:0 as the major fatty acid. Coconut oil has >90% saturates and is deficient in monounsaturates (6%), polyunsaturates (1%), and total tocopherols (29 mg/kg). However, coconut oil contains medium chain fatty acids (58%), which are easily absorbed into the body. Therefore, blends of coconut oil (20–80% incorporation of coconut oil) with other vegetable oils (i.e. palm, rice bran, sesame, mustard, sunflower, groundnut, safflower, and soybean) were prepared. Consequently, seven blends prepared for coconut oil consumers contained improved amounts of monounsaturates (8–36%, p < 0.03), polyunsaturates (4–35%, p < 0.03), total tocopherols (111–582 mg/kg, p < 0.02), and 5–33% (p < 0.02) of DPPH (2,2-diphenyl-1-picrylhydrazyl free radicals) scavenging activity. In addition, seven blends prepared for non-coconut oil consumers contained 11–13% of medium chain fatty acids. 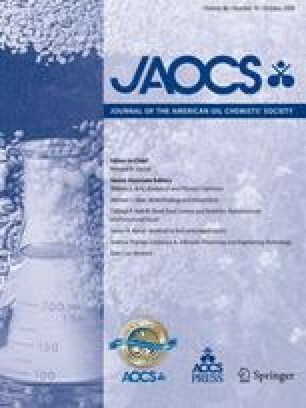 Coconut oil + sunflower oil and coconut oil + rice bran oil blends also exhibited 36.7–89.7% (p < 0.0005) and 66.4–80.5% (p < 0.0313) reductions in peroxide formation in comparison to the individual sunflower oil and rice bran oil, respectively. It was concluded that blending coconut oil with other vegetable oils provides medium chain fatty acids and oxidative stability to the blends, while coconut oil will be enriched with polyunsaturates, monounsaturates, natural antioxidants, and a greater radical scavenging activity. Authors are thankful to Dr. V. Prakash, Director, CFTRI, Mysore, for providing infrastructural facilities, Coconut Development Board, Kochi, for funding the project and Dr. B.R. Lokesh, Head, LSTF Dept., for useful discussions on nutritional aspects of coconut oil.